With the Vancouver Whitecaps announcing on Friday that their star right back and 2012 team MVP Young-Pyo Lee will be returning for the 2013 season, many Southsiders are likely breathing a major sigh of relief. That said, the return of the soon to be 36 year old South Korean legend is occurring with several qualifications, as the Whitecaps having reportedly pledged to limit the amount of minutes he plays, as well as the amount of miles that he travels for away fixtures. Thus, it looks like the Whitecaps are going to need another player to shoulder the load for the Whitecaps at a position that was one of the team’s strongest in 2012. With that situation in mind, it looks to be a smart move on the part of the Whitecaps that they are now endeavouring to bring in one of Canada’s most promising young players to fortify the right back position. Andres Fresenga, who impressed greatly with his play with Canada’s U-23 Olympic Qualifying Team last March, will join Vancouver on trial early in the new year. RedNation recently had a chance to speak with Fresenga to discuss his MLS ambitions, his career to date and to get his thoughts on International football and the Canadian National Team program. Asked how the opportunity to trial with Vancouver came about, Fresenga admitted that it had its genesis in his participation with Canada’s U-23 Olympic Qualifying Team that was lead by Tony Fonseca. “I had sent Tony Fonseca an email to congratulate him on his new position as CSA Technical Director and all of a sudden the next day I got an email from Vancouver that stated that they were looking for a right back and that Tony had recommended me. So I’m going to take advantage of the opportunity and hopefully it works out,” said Fresenga, whose rights are currently owned by Racing Club de Montevideo of Uruguay. Asked to describe what he hopes to achieve by playing for one of Canada’s most important soccer organizations, the young right back/central defender was quick to state that he is aiming to raise his profile after playing and developing as a player in Uruguay for the last six years. According to Fresenga, he is particularly excited about the chance to return home and play soccer in his home country. He also admitted that he would be happy to stay in Canada long term should things work out positively with his trial and then what would be the ensuing one year loan. The scenario in which Fresenga joins Vancouver, for what is likely to be Y.P. Lee’s last season as a player, is one that makes a lot of sense in terms of easing the load of an aging player and grooming a heir apparent for a performer who set the bar very high in his first season with Vancouver. Even though he has gained plenty of experience from his time playing and training in the soccer hotbed that is Uruguay, Fresenga was also quick to admit that he could learn a lot from a player who has played in three World Cups and competed at the highest levels in European club soccer with teams such as Tottenham Hotspur, PSV Eindhoven and Borussia Dortmund. Outside of his determination to continue to learn and develop as a young player, Fresenga is confident that he can adapt his game to the MLS and thrive as a player in the North American top flight. When asked if he believes the training that he has received during his six years as part of one of the top clubs in Uruguay gives him a leg up on players who played during their formative years in Canada and the United States, Fresenga is pragmatic in describing how he has benefited from his experiences in the soccer hotbed that is South America. In addition to being back in Canada, a move to the Whitecaps would also represent a chance for Fresenga to once again play with several of the teammates – Russell Teibert, Bryce Alderson, Ben Fisk – that he has played with in the Canadian National Team program, not to mention several of the players who are considered as possible cornerstones along with him for the Canadian National Team in the years to come. Talk with Fresenga at any considerable length and it becomes clear that playing for Canada at the International level is something that he treasures. 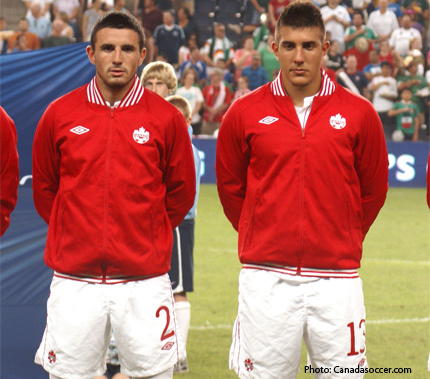 Like many Canadians, Fresenga is eligible to play for multiple countries at the International and he is still eligible to suit up for both Canada and Uruguay at the senior national team level. As is often the case with any promising player who has not yet been officially capped by Canada, this has caused a certain level of consternation among a portion of the Canadian National Team’s most ardent supporters. For those who worry about his future International allegiance, the Toronto native has a simple message. 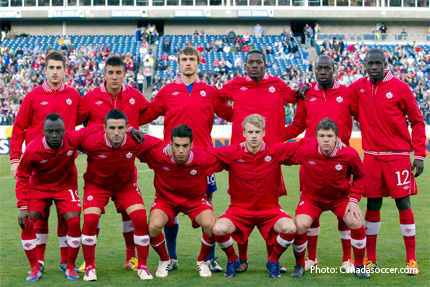 Fresenga made his International debut for Canada when he was 18 years old when he represented Canada at the 2011 CONCACAF Under-20 Championship in Guatemala and played for Head Coach Valerio Gazzola. 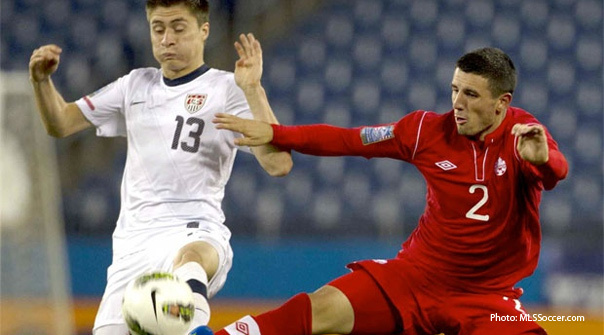 He then turned more heads when he played for Tony Fonseca earlier this year with the U-23 Olympic qualifying team that defeated the United States and finished four overall in the tournament. With the Canadian Men’s National Team recently often resorting to playing natural central defenders and midfielders at right back, Fresenga openly admits that one of his goals is to earn a spot on the Senior National Team. Thus, while Fresenga does feel that he still has plenty to prove in order to earn his spot on the senior national team, he is willing to admit that, with his trial with Vancouver Whitecaps just around the corner, he was buoyed by how well he played in Olympic Qualifying while defending against one of the top young players in the MLS. Even with his impressive performances for Canada in Olympic Qualifying, Fresenga is still likely to be something of a mystery player for a lot of Whitecaps and Canadian National Team fans. However, when asked to describe himself as a player, Fresenga sounds very much like the type of spirited hard working character and team oriented leader that Canadian sports fans generally love to cheer for. Ultimately, Andres Fresenga is a player to watch for Canadian soccer fans. To date he has really been a player that national team supporters have speculated about more than they have seen play. In that sense, his trial with Whitecaps is genuinely exciting because it will mean that Canadian soccer fans could have more opportunities to watch and learn about a rising talent who appears to have all of the right ingredients – character, heart, technical ability, athleticism and maturity - to be a solid future International for the Canadian Men’s National Team, not to mention one of Canada’s MLS clubs. In his own words, Andres Fresenga wants nothing more than to succeed as a Canadian player while representing both club and country with distinction.